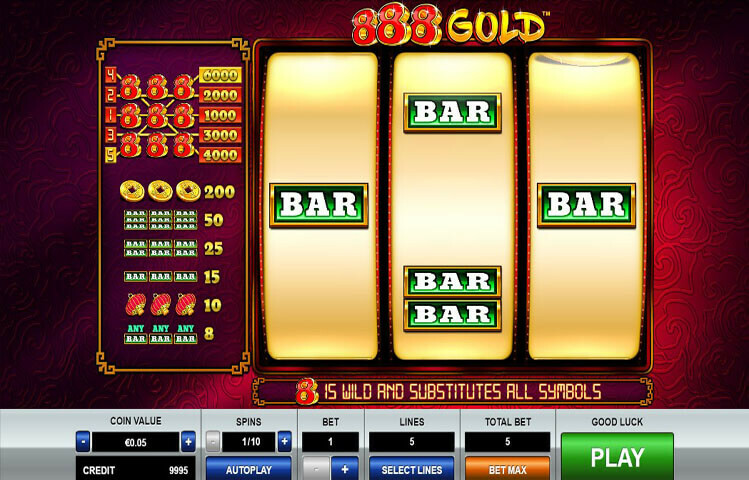 888 Gold is a classic slot machine that is developed by the team at Pragmatic Play. Although the game has 3 reels, it is pretty rewarding. This is because the game has 5 lines, and offers players a wild icon that would help them claim a lot of rewards. The game has a classic theme that it mixes with advanced visuals and a Chinese ancient theme. Therefore, players will see that the reels are dominated by the color red, and they come outlined with gold, as well as golden icons. Pragmatic Play is always releasing new games and this amazing game is one of the latest slots by the developer. The game has an amazing theme as it mixes between both, classic Las Vegas styled video slots and advanced visuals and graphics. This enables players to enjoy the best of both worlds. The game has a 3 reeled setup like classic games. Across these lines, players will see 5 wager lines. These lines are presented by the horizontal lines, and 2 diagonal ones. Across these lines, players will need to get 3 matching icons to claim a reward. Players will be able to find the rewards that they can claim throughout the game play, as well as the special icon of the game at the paytable. Since the game has 3 reels only, players will find that paytable on the left side of the reels. 888 Gold has a Chinese theme. This is why players will see that the reels of the game are outlined in gold. As for the symbols that will appear across the reels of the game, they include golden coins, the lucky Chinese number 8, and red Chinese lanterns. The other icons are the usual bar, bar bar and bar bar bar icons that used to spin on the reels of classic fruit machines. Despite being a classic slot machine, the visuals are of high quality that resemble advanced video slot machines. Therefore, players will enjoy a classic game with a basic format, while enjoying advanced visuals and quite a rewarding ride. Although the game has a classic format, it has a special icon. This icon is the game’s wild symbol. The wild icon is represented by the lucky Chinese number 8. This wild icon will be able to replace all other symbols across the game’s reels and lines. It will replace the icon which is going to give the best payout for the players. The 8s can also give the highest payout when matched on the reels of the game.